Ahoy there its me Matt. I lost a tooth and the tooth fairy didn't come even after a whole day of waiting! We had a rough ride to Cuttyhunk from Stonington. We went though a place called Buzzards Bay. It was rough with swells from the ocean. After we arrived I watched a movie called Magic in The Water. More tomorrow. We were somewhat uncertain on whether to go to Cuttyhunk or Newport. The weather report was for 6 to 8 feet seas further out but only 2 to 4 near the coast with 10 - 15 kts and gusts to 20. We had the current in our favor so we eventually decided to slog it out to Cuttyhunk, not the most popular decision with the crew. The large rollers on the aft starboard quarter are the type that slew the boat from side to side for an uncomfortable ride. However, there was no rain or fog and we made good time and now we're taking a layover day so Matthew can swim and use his surf board. Upon arrival at Cuttyhunk, it was apparent that the high price of fuel has taken its toll. The place was almost empty (see photo) and there were only four power boats. 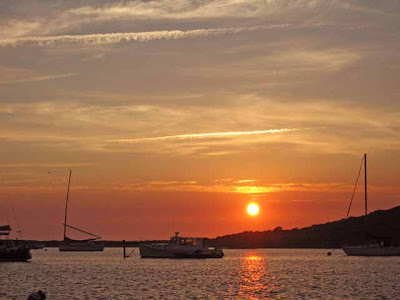 On top of that, Cuttyhunk raised their mooring fee to $40! I wonder if they've ever heard of supply and demand? It reminds me of a story I heard from a committee to investigate tax laws in congress. One member of the council, fed up with unimaginative replies from the budget committee when asked about various way to raise tax brackets asked the budget committee what the revenue would be if they raised taxes to 100% of income. The budget committee dutifully replied with the same number reported as income the previous year. Something wrong there. It's an extreme example but if prices are raised high enough on non-essential items (link moorings and dock fees) then (surprise, surprise), people will stop coming. The comment was lost on the guy that collected the mooring fee this afternoon. 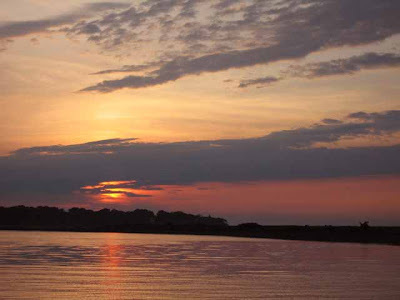 The sun sets over land (across Buzzards Bay) and that must add to the beauty of the sunsets here. There's enough dispersants (?) in the atmosphere to give a really intense sunset, great to watch at night! Hi it's me Matt. Yesterday and today was fun. My family came to visit us in Branford. We went swimming in a pool. Went to Lenny's Indian Head Restaurant for dinner and had fried claims an onion rings. Today they left after Grandpa and I swabbed the deck literally. Then we left for Essex, whoops Nana and Grandpa changed there minds and we're in Stonington. For a good time we were sailing. I read a book on the Titanic and reread my 3 new Dragon Ball Z books. After that I played my Gameboy. More tomorrow on Matt's Blog. Sunday morning in Branford dawned bright and hot. 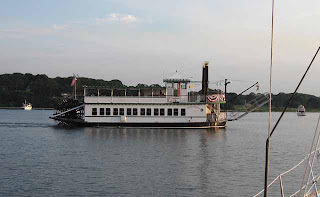 However, the boat had to be washed and water tanks refilled before leaving. Fleetwing carries 150 gallons of water but since we knew we were coming to Branford after only five days out, we had not been particularly conserving. Three kids and four adults is a lot of fun on a boat overnight but they had to leave in the morning and then we were off, heading east. 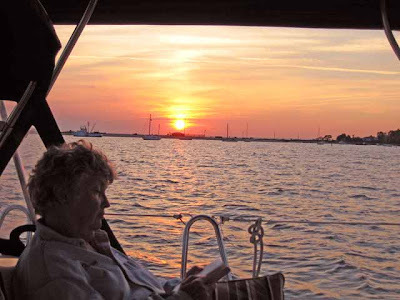 Once again there was no wind so motoring was the order of the day, at least until we reached Fisher's Sound where we sailed for the last two hours into Stonington. McKinney's mooring is still there (and unoccupied - until by us)! 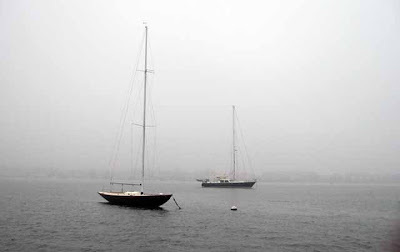 As usual, once in Stonington, the fog rolled in. We wonder what's in store for us tomorrow. We'd like to make Cuttyhunk but that depends upon the weather. One thing about sailing, it gives you a healthy respect for the weather. 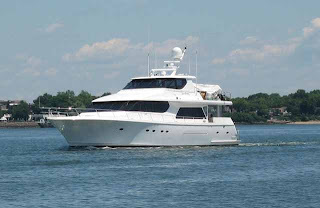 Once again we had no wind but at least the seas were calm as we motored to Branford, CT. We filled up at Bruce and Johnson's fuel dock ($5.259/gal for diesel) to the total of 23.4 gal for motoring from PYC to Branford. The Bruce and Johnson marina is a class act. We were met by three personnel at our dock to help with lines and we were warmly welcomed since we've been there so many times. The dock fee has gone up to $3.50/ft but now they offer free WiFi although I've yet to get it to work. The rest of Matthew's family arrived in time for an afternoon swim. Their pool is pretty big and usually filled with kids so we added a few more. After a lot of splashing and general kid exercising, we were off to Lenny's. I have no problem with dock fees at B&J since Lenny's is a short walk away. There are those who think that other restaurants are just as good but they are wrong, we've sampled them all up and down the east coast. 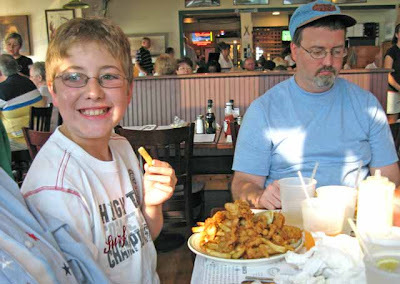 Lenny's speciality is fried seafood and the best of their offerings is fried clams, not the clam strips sissy type but rather the clam with "bellies". They are juicy, very sweet and the batter is fried to perfection - crispy, not greasy. If you arrive after 6:00, expect a wait, 20 minutes when we left after dinner tonight. They deal only in cash, credit cards or checks are not accepted. 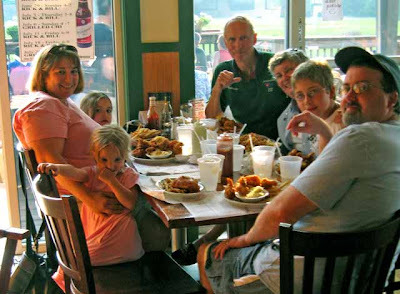 So if you ever visit Branford, be sure to drop by Lenny's and try the fried clams with bellies! Meanwhile, I had my A/C serviced. The A/C air temperature at the air output duct was hovering in the low 60's and I thought it ought to be colder. I had made a reservation a month ago for Jerry Staunton, the service technician, to meet me at Branford. He followed my progress using the Spot link and met us at the marina just as we arrived. The A/C unit had been given an overcharge by the previous serviceman and he corrected the problem. The output temperature is now around 50F. He worked on our refrigeration before and it regularly keeps 0F in the freezer compartment. When you encounter competent technical help, you try to keep track of them and arrange for their help in the future. Tomorrow we're headed for Essex, probably. You'll know where we head if you click on the Spot link. Hey its me again Matt. Today I slept in for awhile after waking to a hoard of flies. A little later I went swimming for quite some time. Then Nana made the nicest breakfast. So Grandpa and I washed the dishes for her. After that Grandpa and I played a game called Munchens and this not a game play with the kids game IT SOUNDS CUTE!!!!! Then after that we went a shore and saw a lot of died jelly fish. I got to drive the dink then I read a lot. And th th thats all folks! We elected to do a layover day at Port Jefferson. There's a pebble beach nearby for walking a dog (and exercising a kid...) so we paid it a visit. 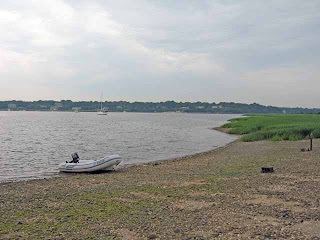 A dinghy ride was in order to explore the area. We found ice at the marina due south of us, not in PJ directly. They complained about the lack of boats this season. The sunset cruise came by, a boat we've seen many times while at PJ. All in all just a lazy day, not bad for being retired. Ahoy, it me Matt. Today I did a lot. I went swimming off the back of the boat twice. One was a swimming lesson and the other was a swim. We left North Port around 1:00. On the way to Port Jefferson I read a lot and we sailed for some time. We arrived at 4:45. There were ferries going to Bridge Port from Port Jefferson. We anchored in a place were you get a nice view of the sunset. I went swimming for the second time. After swimming for awhile I got to run the dink after we were done looking at the depth of the water. More tomorrow on Matts Blog. The Sand City anchorage is very protected and calm. We slept in and Ann prepared sausage and pancakes with real maple syrup, great! I started once again to work on getting the genset started. It would turn over but would not start. I replaced the fuel filter, bled the fuel line and a few other things suggested by technical support over the phone but to no avail. Finally, I checked the battery for the genset (duh, it has a dedicated one) and found it to be low in charge. I started the main diesel and then the genset and found that with the additional voltage from the alternator charging circuit, the genset started right up - so it was the battery after all. Live and learn I guess. So now all boat functions are fully operational. We left Sand City around 2:00 and finally got to sail for the first time. It was a broad reach for about 10 miles with a 10 kt wind, not bad. Once again we saw very few boats, we had the Sound almost to ourselves. 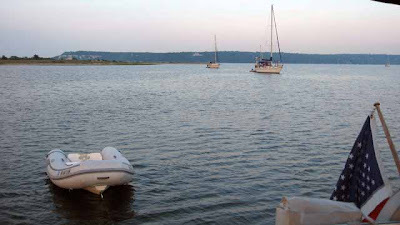 We found only three boats at the Port Jefferson anchorage (to starboard as we came in). As I mentioned last year, the charts bear no resemblance to reality in the harbor. At some time in the past, it must have been dredged since the depths are 20 to 30 feet everywhere. We'll probably stay an extra day before meeting with Matthew's family at Branford and a clam dinner at Lenny's. Hi, its me Matt. Today I finished my last Dragon Ball Z book. So I asked Mom to get me volume 4,5,6,and 7. We went through New York Harbor and my camera breaks, RIGHT WHEN I AM ABOUT TO TAKE A PICTURE!!!!!! Then we make our way to North Port and I went swimming. Last but not least I had a burger with mustard and taco sauce? Dried the dishes then I took a nap. More tomorrow. 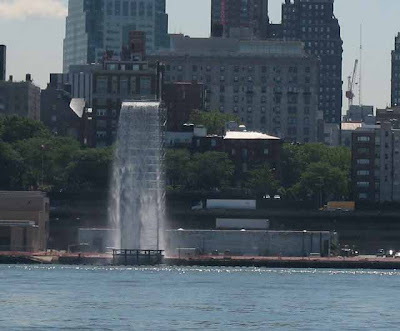 One of Matthew's photos was of the "waterfall" on the East River. It's a temporary display I believe. We had a great ride with the tide today. We left the Hook Mt anchorage with the current behind us, pushing us to 9 kts all the way to the Battery. When we turned the corner, The current was still with us all the way to Execution Rocks! Adding 2 kts or so of speed to a sailboat is a great help. However the most surprising thing is the absence of boats! We were only passed by two pleasure boats (there were lots of police and USGC patrol boats in evidence) and both of those were cruising at idle speed (see photo!). Although it was a Wednesday morning, I've never see the East River so empty! All we did was motor today since there was no wind but then there were no waves either, the Sound was like glass. We anchored in one of our favorite harbors at Sand City near Northport. It's very protected and the holding is excellent plus there lots of room. There's a sand beach nearby if you want to walk your dog or just go for a swim. Meanwhile, I have to work on the genset tomorrow. I couldn't get it to start this morning. Hopefully it's just a fuel filter. Ahoy mates its me Matt. Today I have set off on my journey. 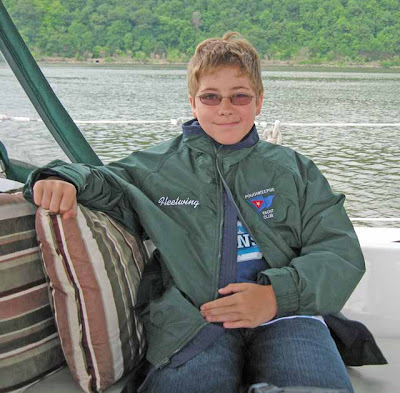 It was wakeup, change and up on deck and Grandpa gave me an honorary FLEETWING jacket (like on Deadlist Catch). We were traveling for 5 or so hours. I was reading for most of the time. 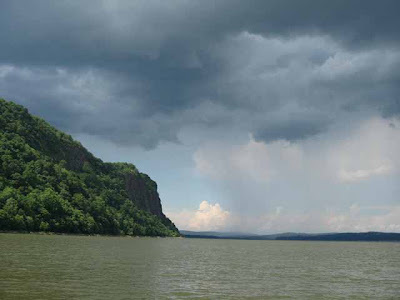 When we arrived there were some thunder storms strong enough that we went below. Then we had dinner Nana and I washed the dishes and on to writing this. More tomorrow. As you can see, Matthew earned his crew jacket today. After an exasperating afternoon yesterday of trying to get the A/C to work, I found it was clogged with vines and eventually I found that by putting a hose on the inlet and letting blast, it cleared the blockage. This morning we got off around 9:00 and motored south to the Hook Mt anchorage. Click on Fleetwing Location at left to see where that's at. It's well protected from a northwest wind which is predicted for tonight although it's quite calm at present. There were thunderstorms all around us but none hit us. The river traffic was quite sparse compared to past years. Perhaps the cost of fuel is having an effect. Tomorrow it's off to Hell Gate and points beyond! We are headed for Maine again in 2008. 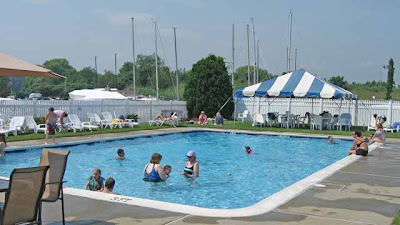 We plan on leaving Poughkeepsie Yacht Club on 6/24, a Tuesday and spend our first night at Haverstraw Bay. Matthew, our oldest grandson, will be with us again until we reach Maine when we will be joined by his family for a week of sailing. 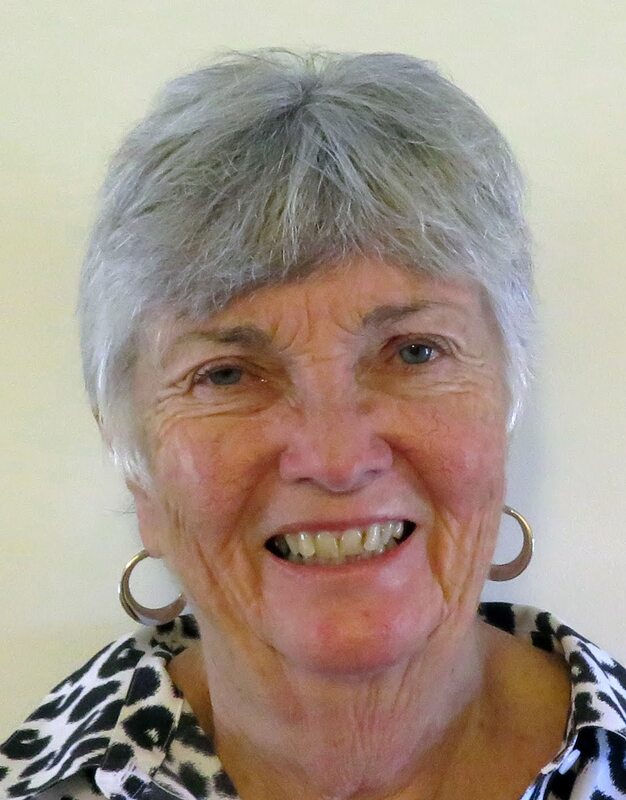 Ann's cousin Richard will join us in late July followed by Don and Liz Bunch in early August and then Leathem and Ann Mehaffey in late August. We are looking forward to an enjoyable cruise with friends. This year we won't do the overnighter from P-Town but rather just harbor hop northward following the same route we took last year on the way home. I will continue the daily blog, of course, but this year I plan something new. I bought the new Spot Messenger which will transmit our GPS position to an overhead satellite every 10 minutes in real time which will be posted to a website accessible by anyone with the link. The real time positional information can be accessed here. I will be using my cellphone as a modem for most of the trip until I get too far downeast (past Mt Desert) when I'll be dependent upon WiFi hotspots. The blog will continue to be written daily but the publishing of the blog will be governed by access to WiFi hotspots or cellphone coverage. Once published, you will be able to read the daily reports. Well, wish us luck. We could use some after our dodger window was punched full of holes from golf ball size hail last week. It's repaired now but it was quite a shock to see all the holes. The steward's car had dimples all over the hood from the impacts of the hail! Several other boat in the yacht club also suffered similar damage, it was some storm!